Aah, look at those beefy new Groco flange adapters and in-line ball valves mated to 90 degree tailpieces. 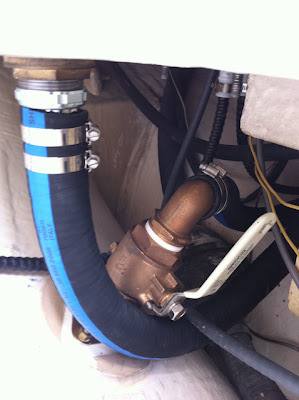 The carefully selected ShieldsFlex II exhaust hose makes the bends gracefully while keeping the hull's integrity. And yes, those are shiny new double-clamped all 316 stainless bands! Did I mention the 1/2" structural FRP backing plates? Oh yes, this is one HECK of a through hull configuration, and my boat is glowing with pride. Fitting all that stuff into the tight working space of the CS27 locker is not a small feat. 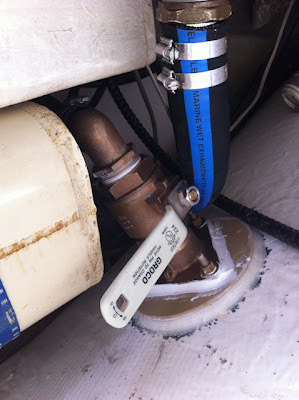 The starboard valve handle can't move 1/4" in any other direction without causing a problem. This was less of an issue with the old gate valves since they didn't need to swing, but these things are worth the congestion. They are beefy enough to be on the space shuttle. I'm going to cut a section from old hose to use as chafe protection, but it's not too bad so I'm not in a hurry.